On Tuesday I talked about the importance lead nurturing has on your sales efforts. Today, you will learn how to create a lead nurturing program that will enable you to work your leads through the sales funnel to get quality leads to surface. Anyone who has paid attention to their leads coming in knows that very few leads come in sales ready. Yet, only about 10 percent of companies actively use lead-nurturing strategies. So, rather than dumping most of your hard-earned leads, I suggest you nurture them through the entirety of their buying cycle, building trust and establishing a relationship that over time will eventually lead to a sale. Begin with a single nurturing campaign that you send out to all your leads. An easy way to start might be sending out a copy of your newsletter or an invitation to attend a webinar or a free white paper. You want to offer something that will engage your leads. Monitor the success of your campaign, further segmenting your leads based on their behavior toward the campaign, like did they open the e-mail or sign up for a webinar? You can also segment based on geography or lead source, whatever makes the most sense for your objectives. Once you have established where each lead is in their buying journey (based on their behavior or segmenting), you can target future nurturing campaigns to address where they are in the cycle. Take an inventory of the different content resources you currently have, including blogs, articles, white papers, and videos. Think about which of your nurturing segments they work for. Some will work for several segments with minor tweaks. If you do not have a library of items to select from, consider the key pieces you need to create for each target group and what the message will need to be. It is important to note that if you have leads in different regions or countries, you will want to make the message specific to their geographic area. Since you are communicating with your leads via e-mail, you will want to keep the content brief. Long e-mails will not be read. If you are including a video clip, keep it short too – about 90 seconds is ideal. 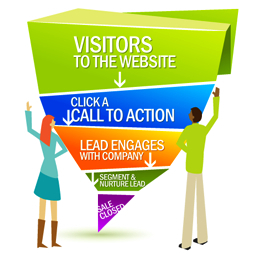 In addition to segmenting the leads, it is a good idea to score your leads as well. I provide what I call “interest scores” for all of my client’s leads to help them nurture, qualify, and prioritize their leads. Most marketing automation platforms offer scoring software. However, if you don’t want to invest in the software, contact producersdigital.com and we’ll happily set up and run your scoring program for you. Studies have shown that businesses with well established, successful lead nurturing programs generate 50% more sales-ready leads at 33% lower cost (Forrester Research). So, if you don’t have an effective lead nurturing program already in place, now is the time to create one.